Isaac and Ishmael his sons buried him in the cave of Machpelah, in the field of Ephron the son of Zohar the Hittite, east of Mamre, the field that Abraham purchased from the Hittites. There Abraham was buried, with Sarah his wife. Although this has been repeated several times, the "years" of Genesis are not the years of the Gregorian calendar we use; in fact, we have no idea what the word, now translated as "year", refers to. We can venture a guess that the word used in the early chapter of Genesis, where men commonly lived over 800 "years", refers to what we now call lunar months. But here, we have no idea how old Abraham was, other than it was considered a "good old age". It is interesting to see that Isaac and Ishmael are at peace, at least sufficiently so that Ishmael is informed of his father's death and comes to bury him. We so often see brothers become enemies in the Old Testament; perhaps Abraham did Ishmael a favor by sending him away. Ishmael was not where he would see Abraham's wealth every day and feel temptation to claim it, for it is always the human tendency to want what one sees. And even though Ishmael was the eldest, Abraham's designation of Isaac as his heir was crystal clear. It is a nice ending. 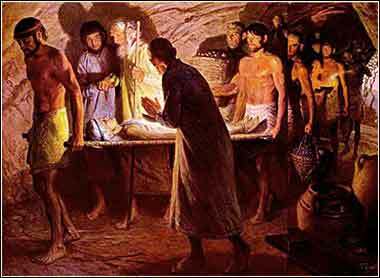 Abraham is buried with his wife, in the cave he bought from Ephron, the Hittie, specifically to use as her tomb. There is no reason given why Isaac chose to go live at Beer-lahai-roi, the famous well where God led pregnant Hagar to save her life. It is in the middle of a desert in the north of the Sinai Peninsula but lies adjacent to the Brook of Egypt. This is not an actual brook, but a "wadi" — a river that is dry much of the time, like an "arroyo" or "wash" in the western United States. Many scholars believe that this is the "River of Egypt" that defines the western border of the land given to Abraham and his descendants by God in Genesis 15.